Another finished project in my studies with Karen Ruane! 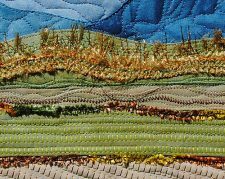 I have been in Karen’s class, Simply Stitch 5, for five weeks. 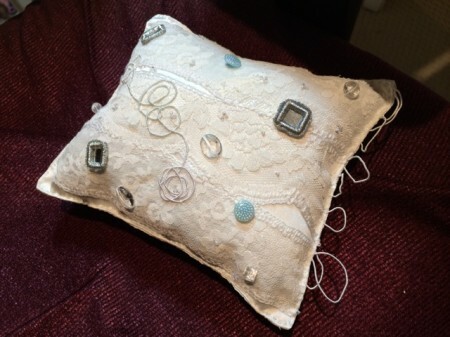 If you have been following me for a bit, you know that in Karen’s classes you are a ‘fly on the wall’, watching her work while stitching your own projects. Karen has been working quite a bit with ‘bling’ in this class. She chose a pin pillow as a project and I decided one could never have too many pin pillows so I followed along. It gave me a chance to use some tiny mirrors I had picked up at a sale in our quilt club and to play with ‘gimp’ – a shiny cord that I had seen many times but never used in a stitching project. 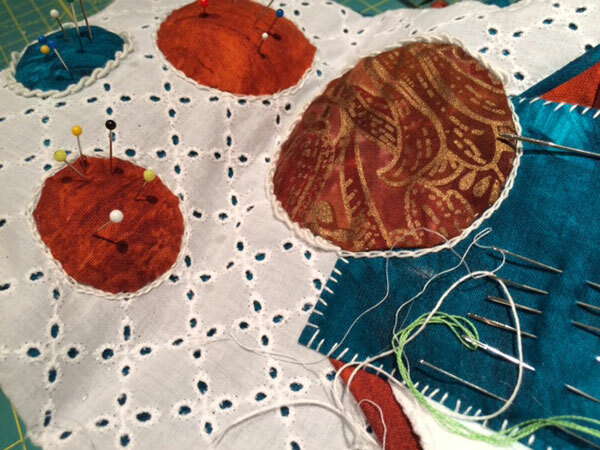 The result of all this play was a quite delicate pin cushion. Here are a few views of it. 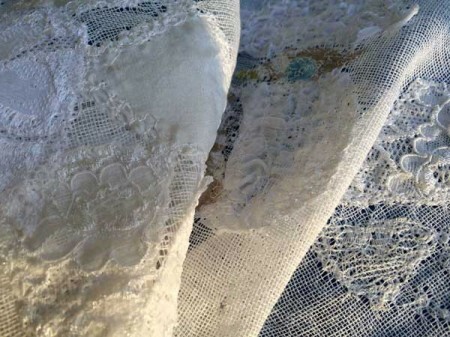 The base fabric is a silk charmeuse with an overlay of lace pieces and, of course, hand embellishment. In addition to the gimp and the mirrors, there a few buttons I had collected and some beads. It is really quite luxurious. Karen made a point to urge us all to use our pillows so we could enjoy them on a daily basis. There is the definite urge to put things away as they are ‘too nice’ to use. 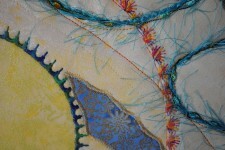 I am quite sure that as I quilt and stitch each day and have it in view, I will have one more reason to smile! Linking to Nine Marie’s Off the Wall Friday. 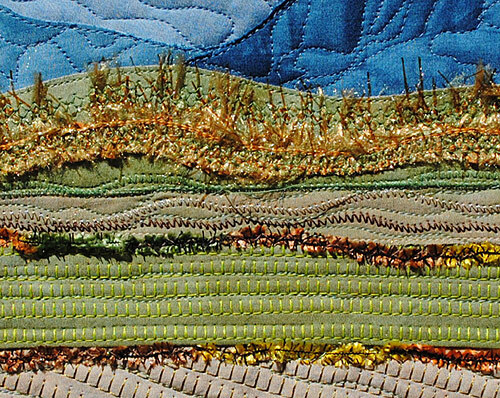 With hand stitching, as with art quilts, the artist could continue to embellish and tweak till eternity. It takes a goodly dose of self awareness to hear that inner voice whispering (or eventually yelling) ‘That’s enough, dear!”. 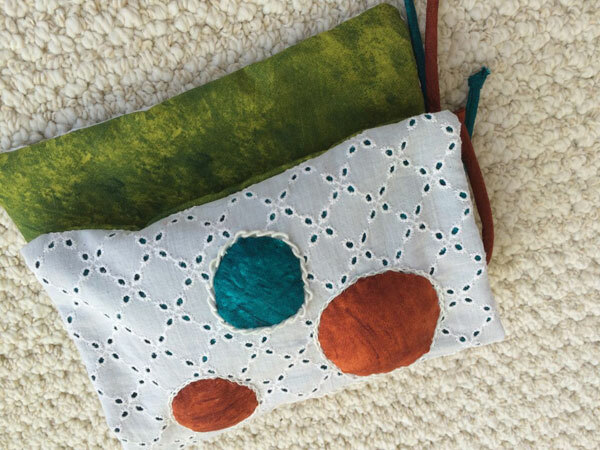 So it was this past week – I realized as I completed some inserts that I had been working on for a few days that the pouch in my hands was done. I know I have shared some glimpses of it these past few months. Here it is, finally complete. This piece is a happy reminder of our trip to Normandy in May. The fabrics were purchased in London, the white overlay, shown below, is a clipping of a handkerchief I picked up at an open market in Paris. 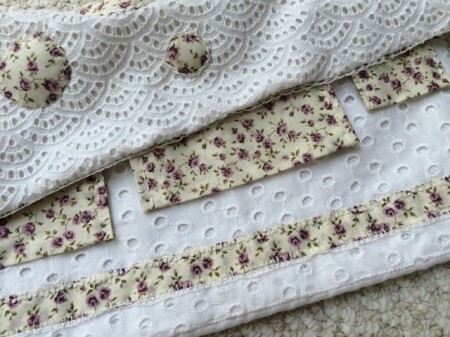 You can see from these detail shots that I made good use of that Liberty fabric I have been blogging about! The pouch is actually lined with the fabric as well. I added a few tabs to the bottom front of the pouch. I am not sure what I will use this pouch for, but if I do travel with it, the tabs will give me a place to place a few needles while stitching. There is a special glow that comes with working with such beautiful fabric and from finishing the composition. It inspired me throughout the week as I took up some new projects. Hope to share more on them next week! In the meantime, I will be linking to Nina Marie’s Off the Wall Friday blog tomorrow, so be sure to check out everyone’s posts. Having finished Glacial Flow, this was a week for play! 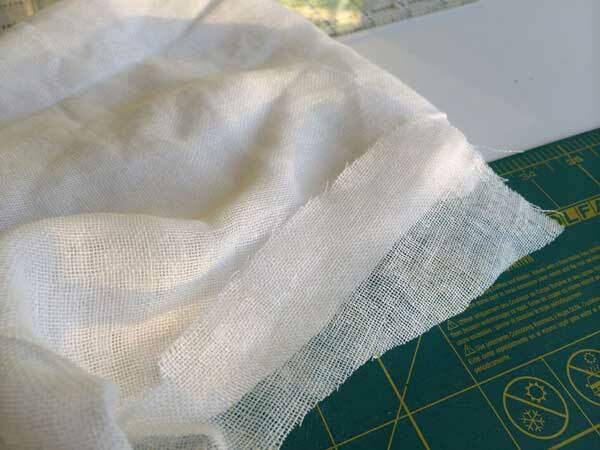 During my studies with Karen Ruane, one staple that I have added to my supplies is cotton scrim. 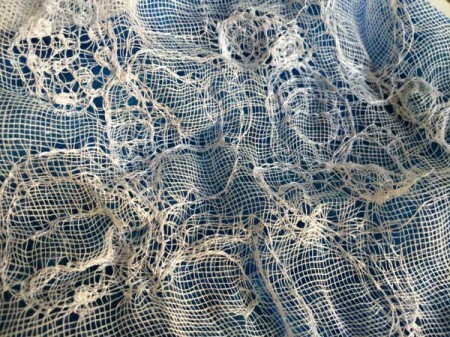 This loosely woven material is even more porous than what we in the U.S. called cheesecloth. I am sure that it has many uses. My friendly internet reference, Wikipedia, describes it as gauze and suggests that it is used in curtains, bookbinding and upholstery. 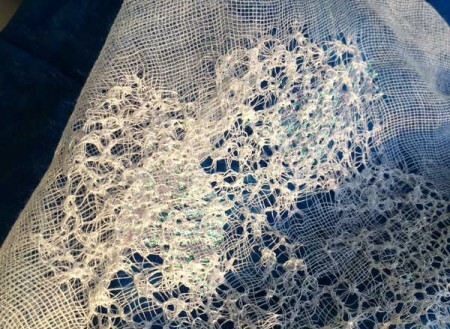 In Karen’s classes, we use it as a base for making ‘lace cloth’. The process of creation begins simply. 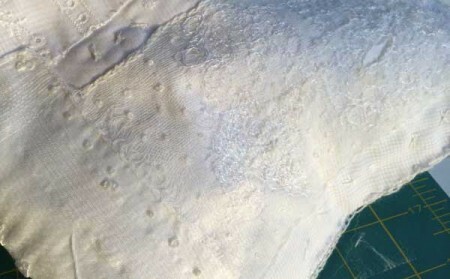 Placed in an embroidery hoop, under the needle of a sewing machine set for free motion quilting (feed dogs raised), stitching over the scrim in tiny tight circles creates a lacey cloth texture. While still stitching on the machine, you can add bits of shiny fabric, silk, pieces of actual lace, or anything that you care to experiment with. The real fun comes after you are done with your sewing machine. Hand-stitching totally changes the character of the pieces. 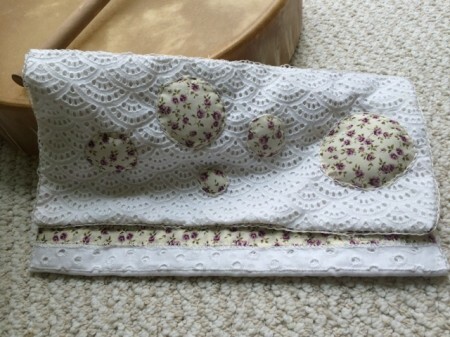 I have used some of my early pieces of lace cloth in the embellished bags that I have made. 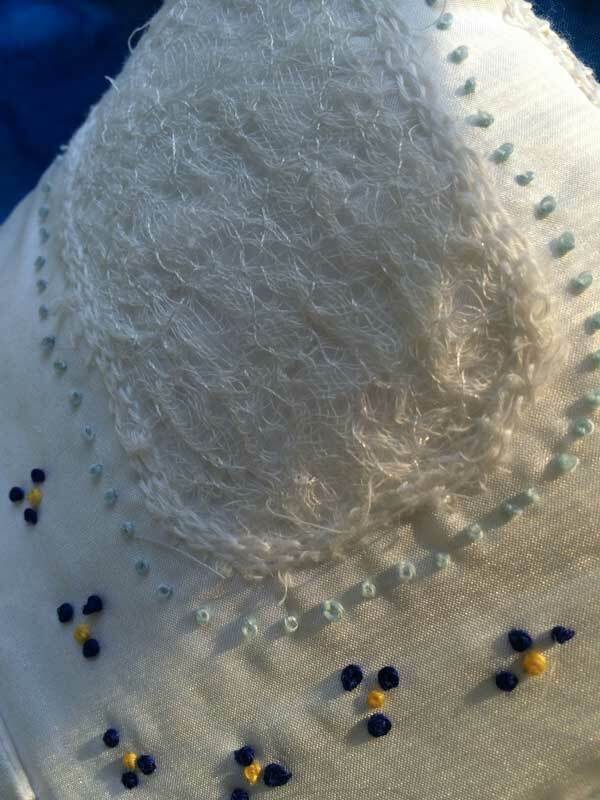 I plan to embellish the pieces that I have been creating this week with more hand stitching even before I use them in a project. The possibilities are endless and the pieces can easily develop into works-of-art on their own. 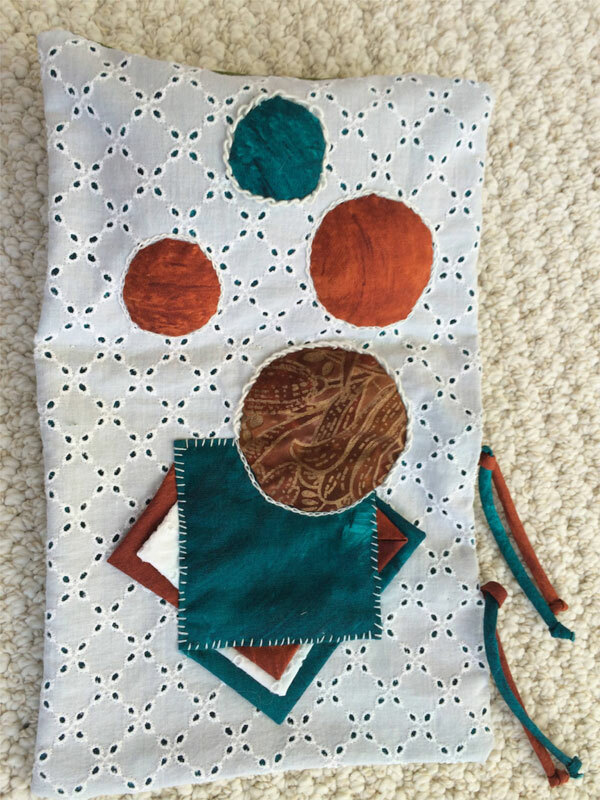 To give you an example of the potential, here is a piece that Karen has on sale on her website. The words that come to mind for me are exquisite, delicate…..what do you think? During our fiber arts group monthly meeting yesterday, I was circulating a project I had just completed and one of our members quizzically mouthed What is it? to me across the room. I smiled. 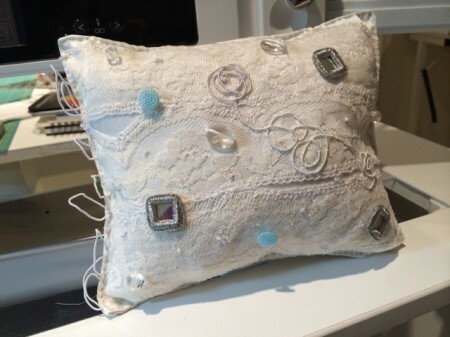 I have been participating in Karen Ruane‘s Pillows and Pages class for the past two weeks. It has been an adventure. Since the class included three separate pillow projects, I wisely opted to create small pillows. 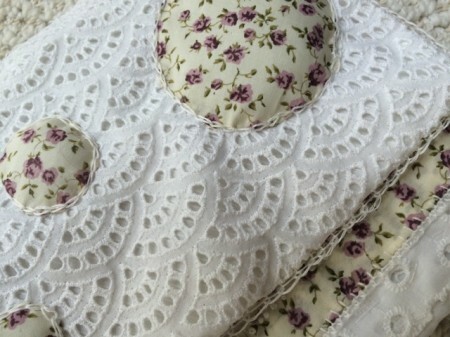 Karen also chose to work on small size pillows that could be used as giant pin cushions. 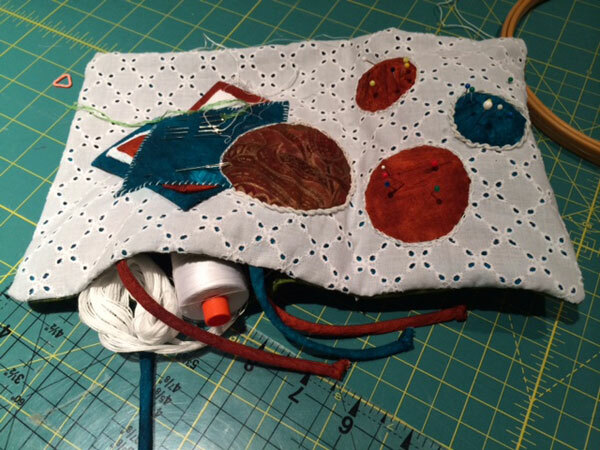 As she drew near completion of the first pillow with us, she decided to add a ‘pocket’ for storing small supplies you might need as you were stitching. I followed suit. It actually folds in half for easier carrying about my home. I am totally enjoying the class. It is giving me an opportunity to create something useful while learning from Karen and honing skills. Over the three pillows, the many elements covered have included ties, tabs, inserts, varied stitches, and, of course, damp stretching. PS I am linking this post to Nina Marie’s Off the Wall Friday blog so please enjoy browsing some other artist’s blogs. 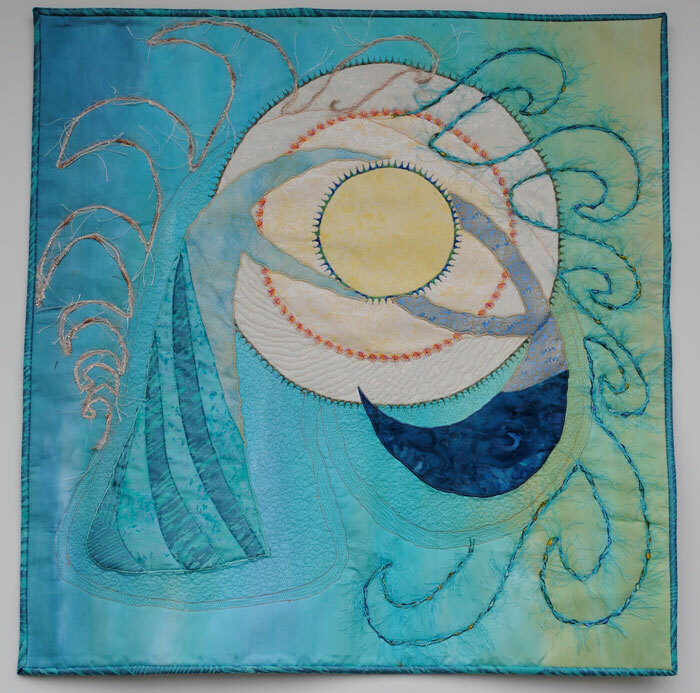 Pieced and appliquéd fiber art quilt with embellishment and decorative stitching. This contemporary art quilt suggests the passage of energy in the martial art of Aikido from one person to another. When the timing between the two parties is in synch, the result is akin to dance. Hand dyed cotton art quilt, pieced, machine quilting and embellishment. 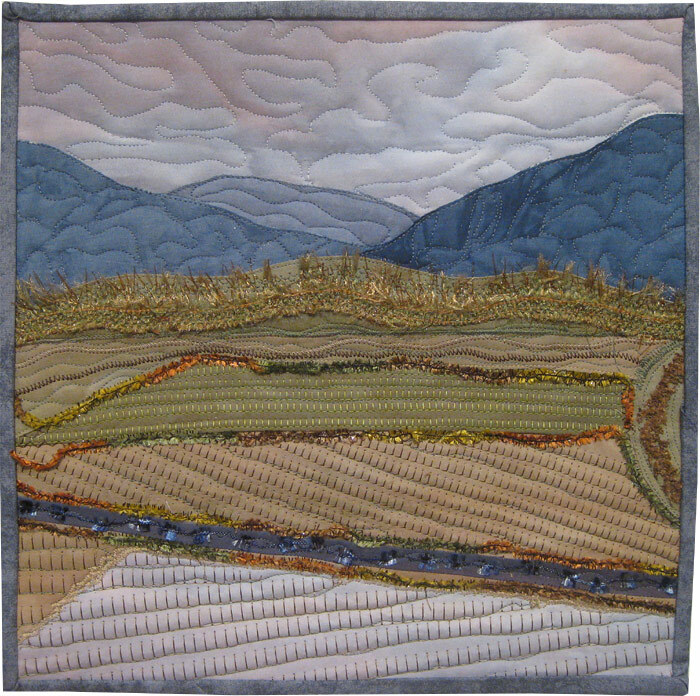 This art quilt is a representational rendition of some rice fields near Kyoto. Adapted from a photo taken on a trip to the area.